If you want to play your bass standing up, you'll need to pick from a selection of bass guitar straps. The best thing about bass straps is that there is really nothing that specific about them; almost any strap that would work on an electric guitar will work on a bass guitar. Therefore, there are many different options for bass guitar straps out there at many different price points. While there is technically nothing different between a bass strap and a guitar strap, the one thing you want to make sure of when you're buying a strap for your bass is that it is long enough. Basses are longer than electric guitars, so you need a strap that will allow you to hold the bass in a comfortable position when you're playing. Most standard guitar straps can easily be extended to a length that will make them usable for your bass. Just make sure you're not buying a strap that is designed for a child or for a small scale guitar, and you will be fine. The first thing you need to decide when you are in the market for a strap is how much you want to spend. If you just want a simple, nylon strap, you can find one for just a few dollars. However, if you want your strap to be personalized or made out of an exotic leather, you can literally spend hundreds of dollars. A number of choices are listed for you below. Levy's - Levy's makes a great nylon bass strap for the guitarist who needs a no-frills strap that won't cost an arm and a leg. Leather ends with double stitching ensure that this strap will hold up under the rigors of gigging. 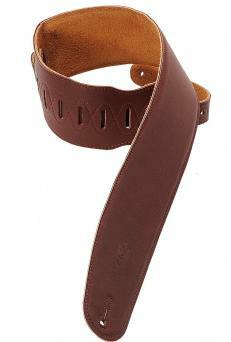 The company also makes more high-end, all leather straps that are padded and built for comfort. Italia Leather Straps - These handmade straps are crafted on California's central coast, and they are simple, elegant and beautiful. They are available in widths of two-and-one-half inches and four inches. Many bass players prefer the wider straps because the extra width provides added stability for the heavier, longer bass guitar. Franklin Straps - This company has a wide range of straps for sale from economic nylon to cotton to high end leather. They even sell straps that are covered in metal for an edgy, shiny look. Anthology Gear Wear - In addition to gig bags and drumstick bags, Anthology makes striking leather straps that are heavy-duty, stylish and extremely unique. Around fifteen different models of bass guitar straps are available from this interesting company. 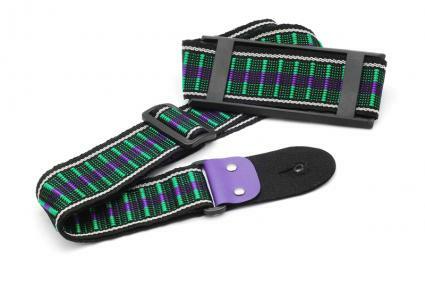 Comfort Strap - These straps may not look super hip, but they are definitely designed for comfort. Their nylon design and thick, deluxe padding are intended to provide bassists with an extremely comfortable strap at an affordable price. While searching for the right strap, it's important to not forget the importance of a good strap lock to help keep your bass from slipping out of the strap. 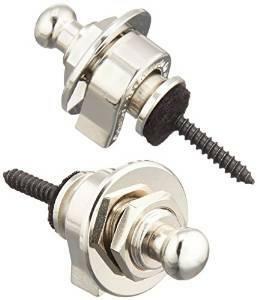 A strap lock is a simple device that attaches to the pegs of a guitar and "pins" the strap to the guitar in a more secure way. After all, a bass can be really heavy, meaning any slight movement could allow the bottom peg to slip right out of the strap and cause impact damage to your guitar. Amazon.com: Amazon offers a wide range of options for musicians from either Amazon fulfillment or independent sellers from around the world. Guitar Center: This store has been offering some of the best deals on music accessories for a long time now. You'll be able to find everything from straps with locks integrated into them to independent strap locks. Musician's Friend: Musician's Friend started out as a catalog company, but has since grown into one of the largest retailers of music equipment on the Internet. Some bass players are interested in finding a great looking, designer leather strap that will turn heads on stage. Others are looking for pure comfort, while still others are only interested in getting a basic, simple strap as cheaply as possible. No matter what your needs are, you can easily find the perfect strap.